Patricia Iona “Tricia” Saeger, age 60, of Cambridge Springs passed away at UPMC Hamot on January 16, 2019, after an unexpected illness. She was born in Meadville on January 3, 1959, the daughter of Robert and Kathleen Wilson Ervin. She married Rodney Saeger on August 23, 2003. Tricia attended Saegertown High School and worked as an inspector for Greenleaf Corporation in Saegertown for over twelve years. After training as a veterinary assistant, she worked for many years at Union City Pet Hospital. She enjoyed caring for her houseplants and her dogs, mowing her lawn, collecting angels and wolves, and tending her flowerbeds. Survivors include her husband, Rodney Saeger, of Cambridge Springs; daughter, Amber James, of South Carolina; son, Kenny J. Steadman and his wife, Cheyenne, of Conneaut Lake and their children: Nevaeh and Nathaniel; son, Shawn Saeger, of Cambridge Springs and his son, Skyler; son, Aaron Saeger, of Greenville and his son, Finley; and brother, Dan Ervin, and his wife, LuAnn, of Meadville. Patty,I’m so sorry you passed away,Even though we haven’t spoken in a long time,I still loved you.Give my mom ,your mom and our aunts a hug for me in Heaven. Our thoughts and prayers go out to her family. She will be terribly missed by all of us. She will always be in our thoughts and may she be with the angels. Szklenski, Michael Joseph “Papa” Sr.
the Van Matre Family began to provide a valuable service to the Cambridge Springs, PA community. 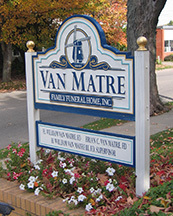 the Van Matre Family continues to provide this same service to communities in northern Crawford County and southern Erie County.